Why are police officers being murdered while wrapped in the protection of body armor? It's a question that's been on the minds of Colorado this year after the gunshot death of one deputy and the serious wounding of three other deputies in one incident in early morning January 1, 2018. The vests commonly seen on deputies both inside and outside their uniform shirt are only protective to handgun bullets. If confronted with a rifle, the current standard issue vests provide inadequate protection against common rifle fire. purpose is reach out to the community through service. 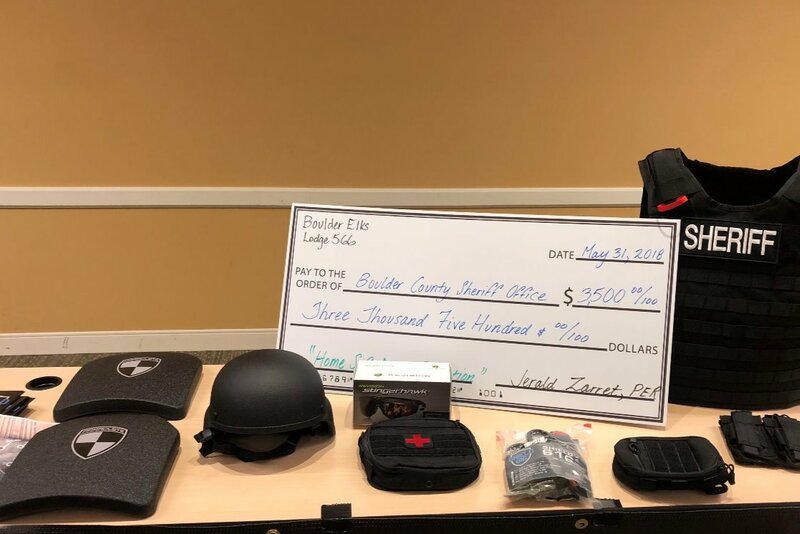 In this case, the Boulder, Colorado Elks Lodge 566 determined it is essential to provide law enforcement personnel rifle resistant equipment including: vests, helmets and Immediate Trauma Assistance Kits (ITAK). In response to this year's tragedies the Boulder Elks have initiated the "Home Safe" Deputy Protection Drive. Elks Lodge 566 is asking the community to help us outfit 10 Boulder County deputies with rifle resistant protective equipment kits. Elks have made a start toward our goal of ten vests. Boulder Elks 566 have seeded the campaign with $3500. This funding ensures two deputies will receive vests this year. Check out our first installment to the Sheriff of our fundraising campaign: First $3500 presentation. Boulder Elks Lodge 566 needs your help. With a total of $15,000 Elks will be able to provide 10 vests to the Boulder County Sheriff's Office. This means 10 more officers protected against rifle fire. This means ten more husbands, wives, sons, and daughters can put on their uniform and return to their loved ones "Home Safe". We have partnered with Shield 616 to maximize the impact of this campaign. Shield 616 is able to purchase this safety equipment at a significant discount meaning your donation goes further in support of this drive. Shield 616 is working with police forces across the United States to meet this need. The Boulder County Sheriff's Office has partnered with both Boulder Elks Lodge 566 and Shield 616 with the purpose of outfitting every Deputy vehicle with this equipment so when officers encounter a possible rifle threat, they are steadied by the knowledge they have the equipment to effectively do their jobs. We need our community's help!! For many Boulder County residents, the Sheriff's office is your local law enforcement. These are your neighbors patrolling your area ensuring crimes are prevented, property is protected and safety is provided. These women and men deserve to have the equipment which allows them to be protected against the threat of rifle fire. These kits help ensure they return to their loved ones, "Home Safe". Please join Boulder Elks Lodge #566 as we raise funds to provide Sheriff's Deputies rifle resistant vests and helmets which ensure they complete their shifts to return to their families, their communities and their own lives "Home Safe". Elks have provided $3500 from the Elks Foundation to seed this campaign. We are asking the community to help reach our goal of $15K.